In the spotlight, as it always is, following a major content update, Overwatch‘s PTR server has received a further batch of adjustments following the arrival last week of new character Doomfist. 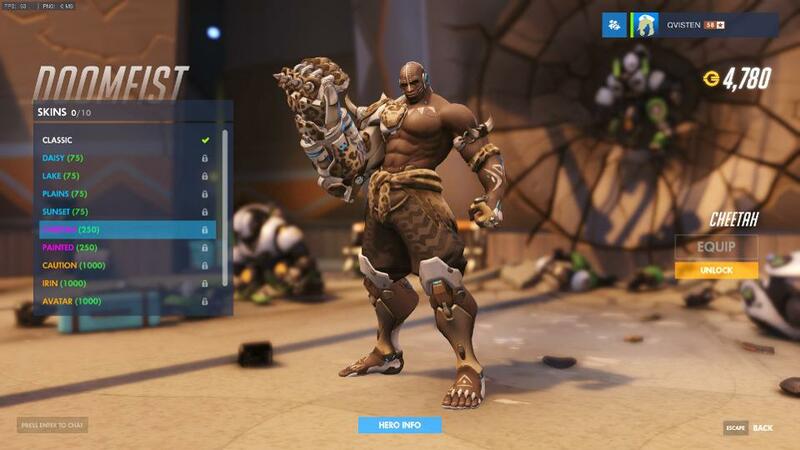 Rolled out to primarily address issues with certain heroes, the patch has also provided the key to Doomfist’s wardrobe, finally pulling back the dressing room curtain on his alternate costumes and miscellaneous cosmetics. There’s an eclectic mix of skins on offer for the shooter’s newest arrival, including full body paint jobs and one that’s seen the offense hero seemingly dipped in a vat of molten metal. You can check out each of them for yourselves via the gallery below, although you’ll need to pop on the PTR server personally to see/hear Doomfist’s sprays and voice lines. On the technical side of things, Blizzard hasn’t wasted any time in taking feedback for Doomfist on board; the developer has made a handful of tweaks to his punchy moveset. For starters, his Rocket Punch ability has had the distance it travels neutered by around 20%, and a new UI indicator has been added to Seismic Slam, making it easier for those not using the default crosshair to discern how much damage it deals. In regards to other members of the roster, changes to Reinhardt, Reaper, McCree and Zarya have been made, although it’s those made to the latter two that warrant the most discussion. The Old West gunslinger should now have a much easier time of keeping opponents in his sights, following a further change to his Flashbang grenade, which should keep those blinded much less likely to escape. Zarya’s Graviton Surge, on the other hand, has received an arguably game-changing buff, as it will now disable all movement abilities of affected targets. If greenlighted for the move to Overwatch‘s live servers, expect the above changes to roll out within a matter of weeks, hopefully alongside the long-rumored repeat of last year’s summer event.